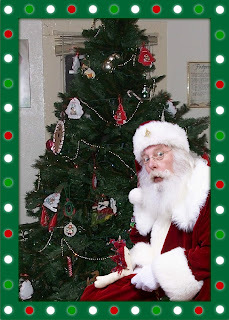 The pics of ICaughtSanta are so easy to make~ You upload a pic, add Santa and a border and share with friends! How Easy is that? There are 20 poses of Santa you can choose from to add to your Christmas picture. Above is the photo I made in less than 10 minutes! It is now a part of our Christmas memories for 2011! The ICaughtSanta pictures are very fairly priced at $9.99! Last-minute shoppers can purchase Gift Cards and eGift Certificates for loved ones with children, making iCaughtSanta.com a great gift idea even if you don't have kids yourself. At this time they are offering a 50% discount to the readers of Dnbuster's Place! Just enter: SANTA50 and get your entire order for 1/2 price!! You can check out the website HERE and order your very own ICaughtSanta picture! I'd love to catch Santa so that I can always show my children that there is a Santa! I would like to catch Santa because it would be a huge surprise for my son. Also it wouldnt let me paste the tweet for some reason so here it is. I WOULD LOVE TO WIN THIS TO SHOW MY SON THAT SANTA DOES EXIST. HE SAYS HE ISN'T SURE ANYMORE. SO, IMAGINE THE SURPRISE ON MY SONS FACE WHEN HE SEES THIS PICTURE. IT WOULD BE PRICELESS!